We drive, they starve. The mass diversion of the North American grain harvest into ethanol plants for fuel is reaching its political and moral limits. “The reality is that people are dying already,” said Jacques Diouf, of the UN’s Food and Agriculture Organization (FAO). “Naturally people won’t be sitting dying of starvation, they will react,” he said. The UN says it takes 232kg of corn to fill a 50-litre car tank with ethanol. That is enough to feed a child for a year. Last week, the UN predicted “massacres” unless the biofuel policy is halted. We are all part of this drama whether we fill up with petrol or ethanol. The substitution effect across global markets makes the two morally identical. Mr Diouf says world grain stocks have fallen to a quarter-century low of 5m tonnes, rations for eight to 12 weeks. America – the world’s food superpower – will divert 18pc of its grain output for ethanol this year, chiefly to break dependency on oil imports. It has a 45pc biofuel target for corn by 2015. Argentina, Canada, and Eastern Europe are joining the race. The EU has targeted a 5.75pc biofuel share by 2010, though that may change. Europe’s farm ministers are to debate a measure this week ensuring “absolute priority” for food output. “The world food situation is very serious: we have seen riots in Egypt, Cameroon, Haiti and Burkina Faso,” said Mr Diouf. “There is a risk that this unrest will spread in countries where 50pc to 60pc of income goes to food,” he said. 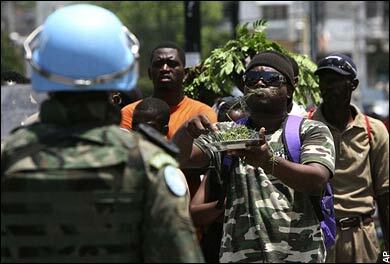 Haiti’s government fell over the weekend following rice and bean riots. Five died. The global food bill has risen 57pc in the last year. Soaring freight rates make it worse. The cost of food “on the table” has jumped by 74pc in poor countries that rely on imports, according to the FAO. Roughly 100m people are tipping over the survival line. The import ratio for grains is: Eritrea (88pc), Sierra Leone (85pc), Niger (81pc), Liberia (75pc), Botswana (72pc), Haiti (67pc), and Bangladesh (65pc). This Malthusian crunch has been building for a long time. We are adding 73m mouths a year. The global population will grow from 6.5bn to 9.5bn before peaking near mid-century. Asia’s bourgeoisie is switching to an animal-based diet. If they follow the Japanese, protein-intake will rise by nine times. It takes 8.3 grams of corn feed to produce a 1g of beef, or 3.1g for pork. China’s meat demand has risen to 50kg per capita from 20kg in 1980, but this has been gradual. The FAO insists that this dietary shift is “not the cause of the sudden food price spike that began in 2005”. Hedge funds played their part in the violent rise in spot prices early this year. To that extent they can be held responsible for the death of African and Asian children. Tougher margin rules on the commodity exchanges might have stopped the racket. Capitalism must police itself, or be policed. Even so, the funds closed their killer “long” trades in early March, causing a brief 20pc mini-crash in grains. The speculators are now neutral on the COMEX casino in New York. What about the California state retirement fund (Calpers), the Norwegian Petroleum fund, the Dutch pension giants, et al, pushing a wall of money into the $200bn commodity index funds? They have undoubtedly bid up the futures contracts, but the FAO says this has no durable effect on food prices. These index funds never take delivery of grains. All they do is distort the shape of the maturities curve years ahead, allowing farmers to lock in eye-watering prices. That should cause more planting. Is there any more land? Yes, in Russia, Ukraine, and Kazakhstan, where acreage planted has fallen 12pc since Soviet days. Existing grain yields are 2.4 tonnes per hectare in Ukraine, 1.8 in Russia, and 1.11 in Kazakhstan, com-pared with 6.39 in the US. Investment would do wonders here. But the structure is chaotic. Brazil has the world’s biggest reserves of “potential arable land” with 483m hectares (it currently cultivates 67m), and Colombia has 62m – both offering biannual harvests. The catch is obvious. “The idea that you cut down rainforest to actually grow biofuels seems profoundly stupid,” said Professor John Beddington, Britain’s chief scientific adviser. Goldman Sachs says the cost of ethanol from corn is $81 a barrel (oil equivalent), with wheat at $145 and soybeans $232. It is built on subsidy. New technology may open the way for the use of non-edible grain stalks to make ethanol, but for now the only biofuel crop that genuinely pays its way is sugar cane ($35). Sugar is carbohydrate: ideal for fuel. Grains contain proteins made of nitrogen: useless for fuel, but vital for people. Whatever the arguments, politics is intruding. Food export controls have been imposed by Russia, China, India, Vietnam, Argentina, and Serbia. We are disturbingly close to a chain reaction that could shatter our assumptions about food security. The Philippines – a country with ample foreign reserves of $36bn (Britain has $27bn) – last week had to enlist its embassies to hunt for grain supplies after China withheld shipments. Washington stepped in, pledging “absolutely” to cover Philippine grain needs. A new Cold War is taking shape, around energy and food. The world intelligentsia has been asleep at the wheel. While we rage over global warming, global hunger has swept in under the radar screen. Inside USA travels to Haiti to look at how the stories of politics, rice and the US are deeply interwoven.